One of the things I really love about France (one of many things - I am turning into a complete and utter Francophile) is their supermarkets. This was confirmed when restocking in Sainsburys upon my return and seeing the so-called "flavouripe" tomatoes, which were such an insipid, weak shade of orange that I was appalled. No beautiful, full-flavoured Coeur du Boeuf tomatoes to be found. Not even anything that looked remotely tasty, besides a packet of hideously overpriced jubilee vine tomatoes. But I digress. I was going to blog about mushrooms. Even in supermarkets, the taste is far superior to the ones we get back home, and these were no exception. A quick text message to my mother reminded me how to make a good creamy sauce (she trained as a Cordon Bleu chef, so is the fountain of all knowledge for these sorts of things) and I was away. Thinly slice the shallots, garlic and mushrooms, then gently fry the shallots in about a dessertspoon of olive oil, until soft. Add the garlic and fry for a further minute before turning up the heat to fry the mushrooms - you want to seal in the moisture, so a high heat is needed. Throw in the mushrooms and fry for a couple of minutes, until cooked but there are no juices running out. Pour in 75ml of white wine and simmer down to approximately half. Season with a pinch of salt and white pepper (it flavours, but doesn't show!). Turn off the heat for the time being. Lightly oil the griddle pan and place it on the hob over a high heat. Place the chicken on the griddle and cook for 5 minutes per side, turning once. This gives the chicken lovely charred stripes on top. Cover in foil and set aside for 5 minutes to rest. While the chicken is resting, turn the heat for the sauce back on and bring it up to bubbling point. Then add 200ml single cream and stir it into the mushroom sauce. Keep on a low heat (but do not let it boil) until you're ready to serve. Once the chicken has rested, cut it into 2cm diagonal slices and transfer to a plate and pour a little sauce over it. 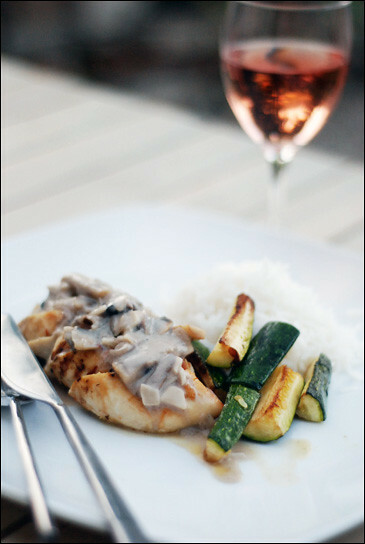 I served this with sautéed courgettes cut into wedges, basmati rice and a delicious glass of chilled Gaillac Rosé. Enjoy!